For Christmas this year, I gave seven gift certificates to close family members for a “Knit 4 U x Me” gift: they can choose from several suggestions, or ask for something else completely. It’s a clever trick, because my giftees get exactly what they want, and I’m not swamped by Christmas knitting. 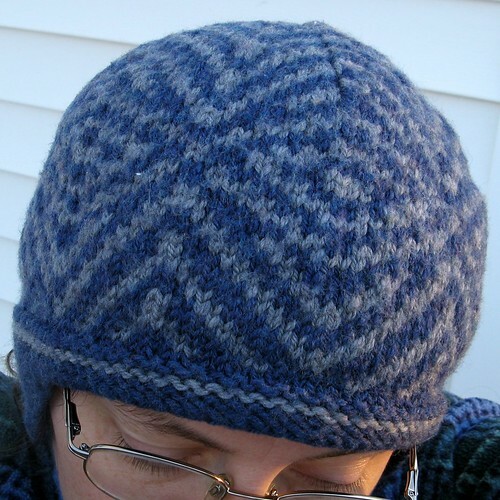 Commercial hat size is “large.” Measure is 22 1/2″. 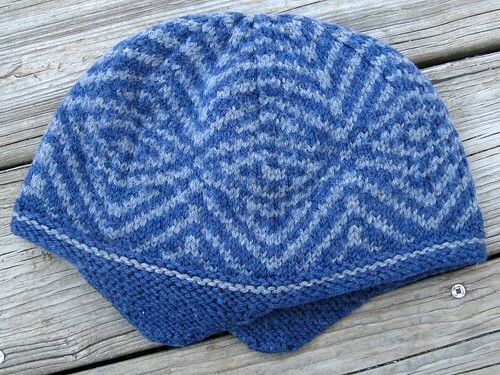 Summer I’m a bill cap or straw, so best use a wool or such yarn. Color wise? Hey, I’m color blind, an old dog, what-do-I-know dog. This left a lot up to me! I wanted to use a pattern that was interesting without being too outlandish, but that my Grandpa could still appreciate. I chose colors he could see, too. Superwash wool is a must for gifts, unless I’m sure the giftee knows how to care for wool and wants to do it. Swish DK is exactly the right yarn for this present. 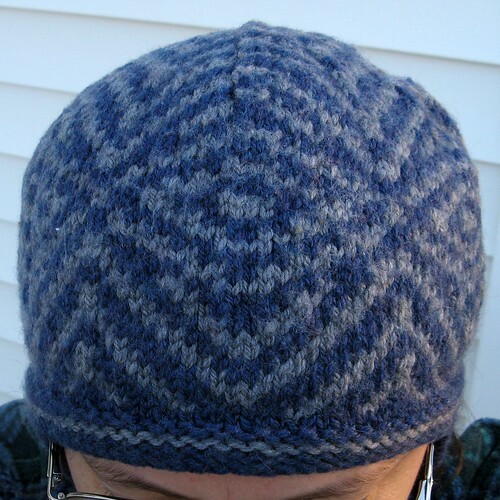 I usually knit a bit larger than gauge, so I used the given needles in order to make a slightly larger-than-pattern hat. Then I threw it in the washer and dryer, to make sure it could handle any rough care it might receive at it’s new home. (If something will be ruined, I would rather do it myself and then try again.) It felted just a tiny bit, and the garter edge wants to flip when it’s not on a head, but it survived admirably other than that. I deem it “good enough” to go to my Grandpa Bob. 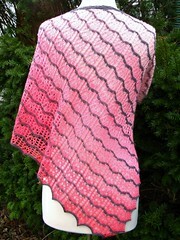 Join my mailchimp list for Remily Knits to receive timely notifications of new patterns and KALs.